Marketing involves a broad spectrum of activities, whose ultimate goal is sales. B2B and B2C are the two business marketing models where sales are the end-result, but, this doesn’t make the two business models alike. 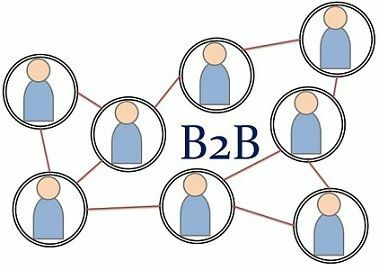 B2B is an acronym for Business to Business, as the name signifies, it is a type of commercial transaction where the purchasing and selling of merchandise are performed between two business houses, such as entity supplying material to another for production, or entity providing services to another. Business to Consumer is another model which is abbreviated as B2C, where the business sells its goods and services to the final consumer. Those companies whose products and services are consumed directly by the end user are known as B2C companies. There are many important differences between B2B and B2C, which you can see in the article below. Meaning The selling of goods and services between two business entities is known as Business to Business or B2B. The transaction in which business sells the goods and services to the consumer is called Business to Consumer or B2C. Buying Decision Planned and Logical, based on needs. Emotional, based on want and desire. A commercial transaction that takes place between two business organizations is known a Business to Business like supplier and manufacturer, manufacturer and wholesaler, wholesaler and retailer. The decision making is quite difficult due to voluminous transactions. In B2B, the businesses are oriented towards making a good personal relationship with the other party to the transaction, as the size of the target market is small in size their major objective is to make customers from prospects. For understanding B2B marketing, we will take an example of Shoe, How they come to the showroom and reach us? The leather, go through various levels to become a footwear. First of all the merchants will acquire raw material from the suppliers, after that cutting and machining is done, which is followed the making of the shoe and finally the finishing is performed on it. Then they are packed in boxes and distributed to the showrooms, which are available for us to buy. In this example, there are a series of transactions that occur for making a single shoe. B2B starts when the raw material is purchased and ends till it is distributed to the showroom. The transaction, which exists between business and the final consumer is known as B2C. This may include any sales process where selling of goods and rendering of services by the company is done directly to the end user. The decision making in B2C is quite easy because the transaction is a single step, and does not involve many persons. The target market is very large and there are millions of consumers, so the major try to make buyers from shoppers. Nowadays, the consumers can purchase goods online too, which is also a business to consumer transactions where a consumer can select the product online and order it, the company will deliver it at the residence of the consumer. For example, Purchasing clothes from a mall, having pizza in Domino’s, pay for internet connection, taking beauty treatment from a parlor, etc. B2B is a business model where business is done between companies. B2C is another business model, where a company sells goods directly to the final consumer. In B2B, the customer is business entities while in B2C, the customer is a consumer. B2B focus on the relationship with the business entities, but B2C’s primary focus is on the product. In B2B, the buying and selling cycle is very lengthy as compared to B2C. In B2B the business relationships last for long periods but in B2C, the relationship between buyer and seller lasts for a short duration. In B2B, the decision making is fully planned and logical whereas in B2C the decision making is emotional. The volume of merchandise sold in B2B is large. Conversely, in B2C small quantities of merchandise are sold. Brand value is created on the basis of trust and personal relationship of business entities. In contrast to, B2C where advertising and promotion create brand value. The two business models cover the complete business process when they bring together. B2B is mainly for those entities which sell their products to other business entities by adding value. If we talk about B2C, it is for those entities which are engaged in the sale of their products to the final consumer who is not going to resell them. Nice article. It provided me a lot of help to understand this concept.